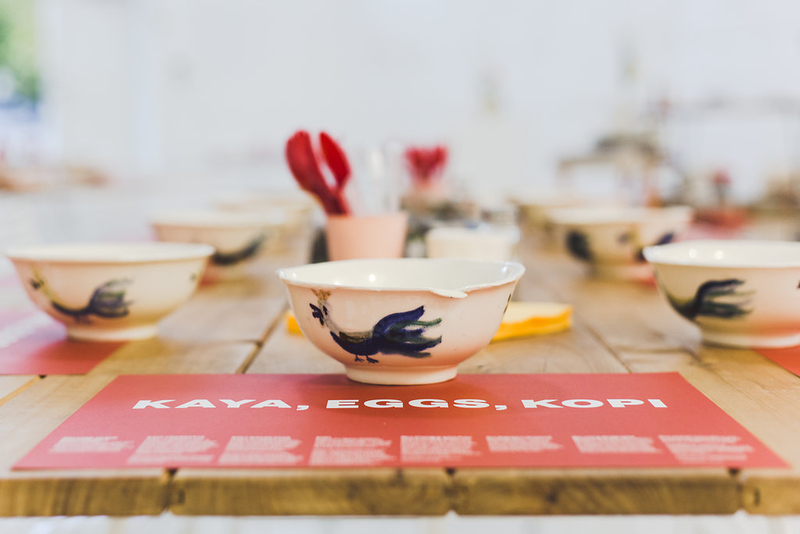 Ruby White will be familiar to many as the creative mastermind behind Miss Changy, a food-as-art project that has recently brought some of the most exciting pop-up culinary experiences in Tāmaki Auckland. In late 2017, she opened Small Fry at Te Tuhi, a unique cafe in Pakuranga where everything, from the ceramics to the furniture, not to mention the food, are hand crafted by White (the cafe also made Metro’s Top 50, no mean feat for a fledgling eatery). On the 25th February, Miss Changy will be hosting a pop-up dinner in collaboration with Da Lin, with food inspired by both of their upbringings. White is also participating in a group show at Corban Estate Art Centre, opening on April 12, and will feature in an upcoming episode of Both Worlds, a TV series about young, multi-cultural New Zealanders. 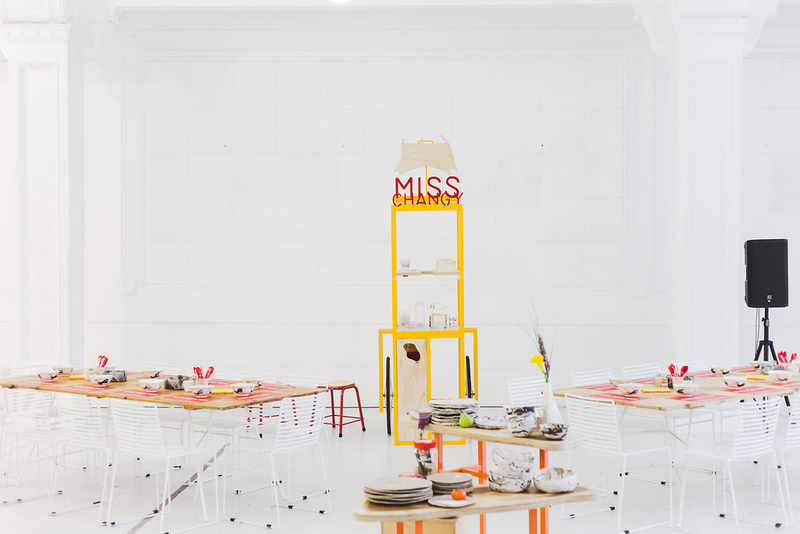 Amy Weng spoke to White about her practice, subverting the Ford assembly line, and the art and politics of food. 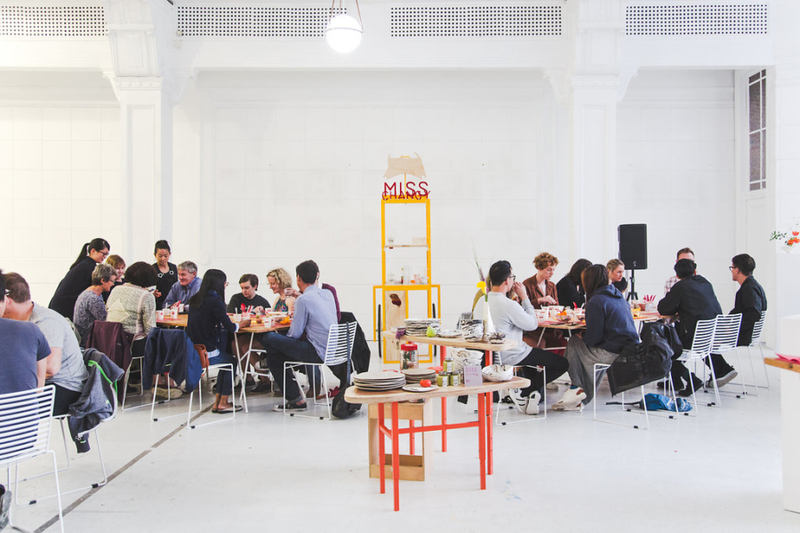 How did you decide that you wanted to make food and dining a part of your artistic practice? To be totally honest, food and eating was never something I considered to include in my art practice. Miss Changy was born out of procrastination from my art! I was in a creative ditch and cooking was a private escape. In hindsight, food was an obvious theme in my art practice – painting with knives and forks, handmade recipe books, films and photography of people eating, abstract food sculptures etc. – but it wasn’t until much later that I had my food-art epiphany. We aren’t trained to see food as art so I think all my previous attempts at integrating elements of consumption into my work was a way of trying to justify food as contemporary art. I had to augment the situation in some way otherwise it wouldn’t be “art”, you know? When I started spending more time on Miss Changy than my Elam art projects it just made sense to bring it to a crit – I was part way into my honours at the time. It was a vac-packed bag of laksa paste. There’s an interesting connection between art and food. It immediately brings to mind the work of Rikrit Tiravanija and his Untitled (free), where the emphasis of this work is on the social relations that are established over the preparation and consumption of food. And a work by Nao Bustamante and Coco Fusco entitled Stuff, that explores the relationship between food, gender, and sexuality within the socio-economic context of Latin America. Both these works were exhibited at Artspace, Auckland. In both these works there’s a kind of ritualisation around the food. The food experiences that you create also have an element of ritual, like the reciting of blessings during the tossing of lo hei 撈起, or yusheng 魚生, at Chinese New Year. Is that element of ritual important to your work? And how do you see your work talking to the idea of food in art and art history? Ritual is definitely something that is important to me but it’s not so much around the food and not something that I have documented for people to see yet. For me, the final art object, for example the chopsticks or my rooster bowls, are a physical byproduct of the artistic process. The act of making constitutes 90% of my art. I have about 150 pairs of handmade chopsticks. 300 individual sticks. I start with a piece of Kauri, Rimu, Jarrah or Pine that is then cut into thin strips and then individually sanded into shape. After that they were all oiled every 24 hours over the period of a week. This process takes a lot of time and a lot of patience. The New Zealand and Australian hard woods add value to the item and represent place. I was born in Australia but I feel like both Melbourne and Auckland are my homes now. The pine references disposable chopsticks which I am really against. The same with my rooster bowls. I use a slip casting method, a technique for mass producing ceramics that are then bisque fired, painted, glazed then fired a second time. I have painted over 700 roosters since I started making these bowls, I’ve got my painting time down to something like 30 seconds per rooster. These repetitive actions speak to the capitalist notion of the artist as maker. I want to mimic something similar to the Ford assembly line but instead of having a factory to do it I just have my own two hands. Aspects of this does come into place when I am prepping for an event and how people operate in the kitchen, but the food is more solely to do with culture. Both sides of my practice are representations of my cultural background and personality, but feeding people is definitely more an expression of love than anything else. I’m definitely a lot more sensitive to people enjoying my food versus my ceramics because when people don’t like my cooking all the time and ingredients used to create that dish have all gone to waste. Which is heartbreaking – luckily it doesn’t happen often! I don’t know if my work adds a lot to the conversation about food in art. One thing I did struggle to over come was the genre of relational aesthetics. People were very quick to draw comparisons to my work and that of relational aesthetic practices… I want my work to be able to stand alone with or without human interaction. I don’t need people to justify my art nor do I want to exploit my audience to complete my work. This comes back to the same issues I was struggling with at the start, on how people need a justification for why or how food is art. It’s so everyday, but it speaks to us on a multitude of levels- our senses, human survival, society, politics, culture. I feel like my art is described best by the concept Joseph Beuys coined, Social Sculpture. When I curate an event it’s like a kinetic sculpture and it’s all working towards inciting some kind of change in society or an individual, even if it’s as simple as providing a beautiful, unique experience. Something that can be remembered and appreciated. Recently, I’ve been reading a lot from Asian chefs and food writers reclaiming their food culture as an expression of deep connection with their heritage and as a rally against white food writers and chefs trying to exoticise their cuisine. For instance, I was following the incident with repeat offenders Bon Appetite, and their video about how to eat pho that was widely ridiculed by the Asian-American community. Munchies did a week long feature on Chinese food, including this response by Clarissa Wei on the difficulty of being a Chinese food writer in a western culture that rewards cultural appropriation. And there was something by Serena Dai on Eater on gastronomic bigotry amongst food critics. There’s also an epic podcast called Racist Sandwich that talks about the inherent politics of how we consume, and how we produce food. Did any of these issues cross your mind when you came up with the idea for Miss Changy? Do you consider your practice political in any way? I wouldn’t consider my project to be overtly political but my intention with Miss Changy is to trigger confusion and generate conversations about internalised concepts people might have around Chinese people, culture and food. The name Miss Changy is a satirical joke in its self. It plays off the racist “Ching Chang Chong” fingers to eyes representation of Chinese people when I was growing up. But also doubles as a colonial appropriation of my Chinese name 嫦潔 (Chang-Jet), I am half European-Australian so the hybridisation of my name is an acknowledgement of my paternal half. I feel like there is a growing chorus of young, entrepreneurial people of colour who have who have struggled with their identities, but are now harnessing their cultural heritage to empower themselves and take ownership of who they are. That is what Miss Changy is for me on a personal level. To this day I am still being spilt in two, for and by people trying to “understand” what I am. What I do. I don’t do “asian fusion” I do what’s in the fridge. As cliche as it sounds, I don’t want to make it easy for people to categorise what my brand is because I don’t want to be reduced to a category. I think a lot of people who have a similar story to me feel the same way. For people of colour who have grown up in a society where we physically look different, we’ve struggled with being put into incorrect boxes and being treated differently our entire lives. I want to break down this unspoken expectation that Chinese food is cheap and Asian-Fusion is somehow upper class? I had a person get angry at me once for charging $15 for a bowl of laksa. I get mad thinking about it. Some people just have no idea how much work and effort goes into food. Sourcing ingredients, recipe refinement, prep, line cooking, service, cleaning up. This demonstrated a lack of understanding and appreciation of both food and labour. And that’s what Miss Changy is trying to identify. There is a huge disconnect between the handmade, cooking and people in our societies today. People don’t know how A got to B and they hardly ever ask the question. When you’re confronted with a meal where the bowl and chopsticks and the table and chair have all been handmade by the cook, I would hope it makes you think a bit more about the process behind the entire meal. Recently there have been a few exhibitions that I have been thinking about in terms on manaaki. One of these was lei-pa, which deals with food explicitly. Another was a project at lowtide called Decolonising the Diet (by Louie Bretana, Divyaa Kumar and Wai Ching Chan), and tangentially, Remedial Learning, which was a project I organised at RM . Manaaki often refers to hospitality and hosting, welcoming people through gestures like food. But I also understand manaaki as giving mana to people. Treating people as equals and giving them a sense of ownership over place. It’s a reciprocal relationship. As tauiwi artists, I wondered whether this was a useful principle to consider our relationship to this land. To me, food seems like one way of doing that. Yes totally. This makes me think about something Gustavo Arellano said “Humans have always demonised the cuisine of ‘the other’ because it is the easiest way to say someone is less human.” The classic example, Chinese people eat dog. However, by the same token food is one of the easiest ways to make a culture more accessible. I can’t remember what it was called, but I read about a pop-up dinner in New York that was focused on Iraqi and Afghani food in light of what was going on politically at the time in America. Reintroducing people to a part of the world that has become synonymous with terrorism and religious extremists and being able to humanise it using food is incredible. I’ve definitely become more aware and interested in the local and native produce Aotearoa has to offer. This will be my eighth year in this country, and it’s an interesting thought that my pursuit in local ingredients might come from a place of ownership. Using local ingredients brings grounding and reason to many dishes I think. From an art practice perspective where you source your ingredients changes meaning – depending on what you want to say of course. I’m thinking a lot about the difference between a cooking-related art work vs the real food and hospitality industry. All my Miss Changy events have involved payment to cover the costs of ingredients and my time but people come to these events wanting to engage on a more personal level, their guards are lowered and it’s more about being friends than being a customer. It’s equal despite having exchanged money to be there. You don’t walk into a cafe expecting or necessary wanting that. From most customers perspective there is a hierarchy. I feel like my cafe, Small Fry at Te Tuhi, isn’t an activated art work but the events that I choose to host outside of it’s general operating hours will keep it on the cusp. 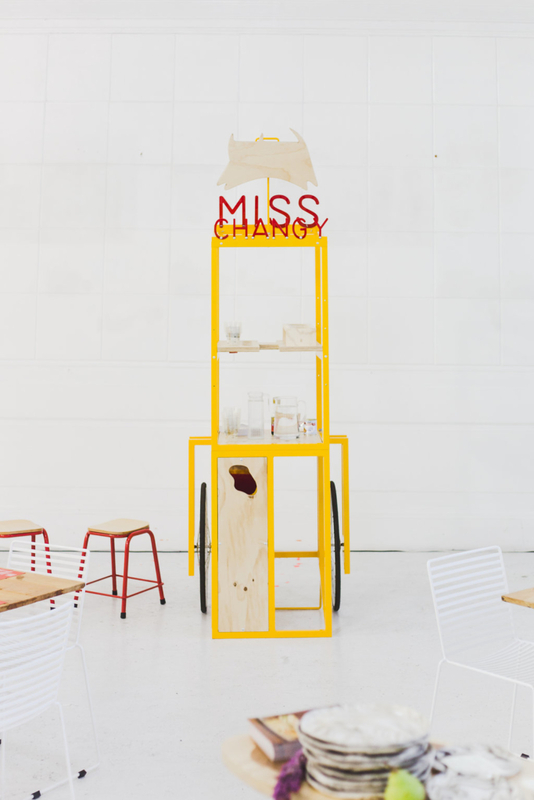 The Da Lin X Miss Changy pop-up event is now fully booked.